Subject: LongIsland.com - Your Name sent you Event details of "Fridays at Six Music Night"
Cost: Admission is $15/person | free to Bridge Gardens members. Start your weekend off with the live music of Joe Hampton and the King Pins! Bridge Gardens will provide the beautiful, flower-filled setting, just bring your picnic and a blanket, and relax with friends while you enjoy the magic of a summer evening. 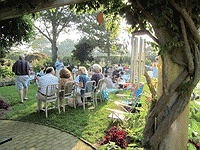 Music begins at 6:00 p.m. and concludes at dusk. Admission is $15/person, free to Bridge Gardens members. Parking provided on-premises. For more information and to reserve, please call the Peconic Land Trust at 631.283.3195, ext. 19 or email to Events@PeconicLandTrust.org.